In the case of Artificial Intelligence, have we become too preoccupied with the technology and failed to focus on the context in which AI is used and who will use it? 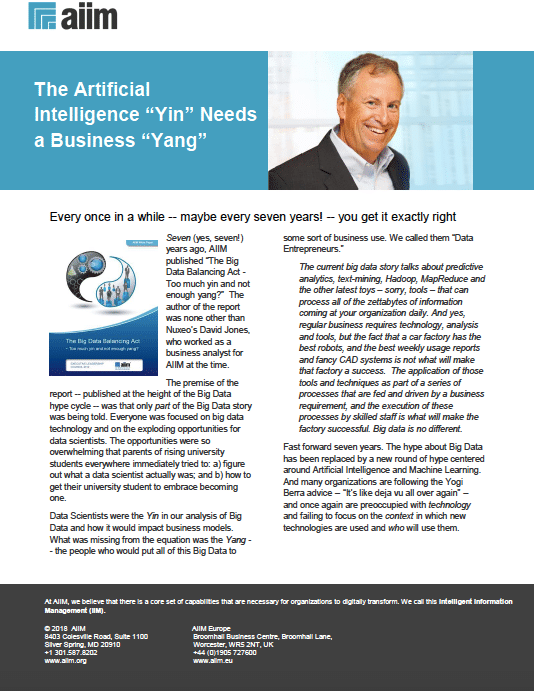 It's a similar case to what we witnessed almost seven years ago with the rise of Big Data - everyone is focused on the technology itself (the "Ying") and overlooking two important points with our conversations about AI (the "Yang"). Point One: the painful truth is that content is different from data. It’s messy. There are lots of varieties and forms. It represents over 60% of the rising tide of information coming into our organizations, and it doesn’t easily lend itself to storage in the rows and columns of a database. Point Two: capitalizing on this opportunity - turning “content” from a “risk” that needs to be “controlled” to a source of new value and insight - requires that the focus of AI shift to the business context in which these tools are used. Generic AI engines are truly impressive in what they can do, but for organizations to move to the next level, these engines need to be geared to specific business processes. Learn how to ensure your AI approach is balancing both the "yin" and the "yang." Just fill out the form on this page to download this free Tip Sheet and learn more.